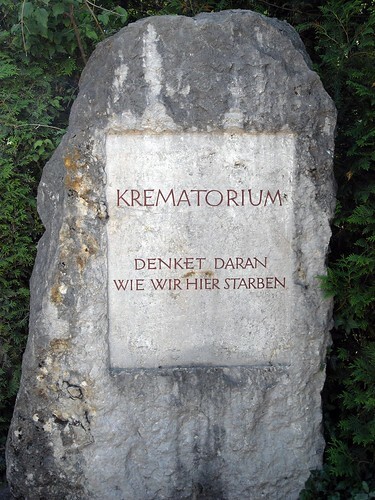 Krematorium Monument, Dachau, originally uploaded by Eric Jeschke. UPDATE: more correctly, “Think about how we died here”. See comments. What it actually says is “Think about HOW we died here.” This sign is near the entrance to the gas chamber building, so it is telling you to think about how the Jews died in the gas chamber here. Thanks, Geseke. My German is not the best. Of course I should have picked that up wie==”how”, but somehow I missed that.